← What is Posterior Cortical Atrophy (PCA)? Mild cognitive impairment (MCI) is a term used to describe a condition involving problems with cognitive function (their mental abilities such as thinking, knowing and remembering). People with MCI often have difficulties with day-to-day memory, but such problems are not bad enough to be defined as dementia. This factsheet explains the link between MCI and dementia, and the benefits of having MCI diagnosed. It then looks at reducing your risk of developing MCI and dementia. Memory loss and other cognitive problems can arise from many different causes. For some people diagnosed with MCI, memory loss will be the first sign of Alzheimer’s disease. For some of those with other cognitive problems, these will be the first signs of vascular dementia, fronto-temporal dementia or dementia with Lewy bodies. For information about the different types of dementia, see factsheet 400, What is dementia? Other people will have MCI as a result of a curable condition such as stress, anxiety or depression, or from physical illness or side-effects of medication. A doctor may, or may not, be able to say what is causing a person to have MCI. Different studies suggest that between 5 and 20 per cent of older people have MCI of some form at any one time. The figure depends on how MCI is defined and where participants for the studies were selected from (for example, from clinics or the wider community). People with the ‘memory loss’ form of MCI make up about two thirds of all cases. These findings are important because people who have MCI are at an increased risk of going on to develop dementia. In studies carried out in memory clinics, 10-15 per cent of people with MCI went on to develop dementia in each year that the research results were followed up. In other studies the rates are about half this level, but MCI still represents a significantly increased level of risk of dementia – about three to five times the risk of someone without MCI. Although MCI significantly increases someone’s risk of developing dementia, not everyone with MCI will get worse and develop the disease. Some people with MCI remain stable over time, and a few people improve and no longer have any problems. These different outcomes reflect the range of different causes of MCI. Can we identify the people with MCI who will go on to develop dementia? A lot of research has focused on identifying people with MCI who will go on to develop dementia. This is important because it would mean that people could be offered a range of support at an early stage in the illness. In the future, for example, researchers might seek to develop drugs to prevent the progression of MCI to dementia. Researchers have tried to identify people with MCI who will progress to develop Alzheimer’s disease by using different types of scans, including magnetic resonance imaging (MRI). These help to detect changes in brain structure and activity. A different approach is to measure the concentration of proteins in the cerebrospinal fluid, which circulates around the brain and spinal cord. These proteins are studied because they may reveal that the changes in the brain seen in Alzheimer’s disease are already underway. Some of these techniques show promise, and some are beginning to be introduced into routine use by doctors. This is, however, an area of ongoing research and it is not yet possible to predict with certainty whether a person with the memory loss type of MCI will develop Alzheimer’s disease. Research to identify which people with non-memory loss MCI will go on to develop dementia is progressing, but is much less advanced. What are the benefits of diagnosing MCI? The main benefit of diagnosing MCI is that it helps to identify people who are at increased risk of developing dementia. GPs can refer someone with MCI to a memory clinic for more detailed assessments over time. Many people with MCI will develop dementia, so this approach leads to people with the disease getting an earlier diagnosis. This means that people can have earlier access to treatments as well as practical information, advice and support. Early diagnosis also allows people to plan ahead while they are still able to do so and – if needed – be encouraged to adopt a healthier lifestyle. At present there are no drugs that have been approved for treating MCI, as opposed to dementia, outside clinical trials. It was initially hoped that the dementia drugsdonepezil (eg Aricept), rivastigmine (eg Exelon) and galantamine (eg Reminyl) would help with symptoms of MCI. However, extensive trials of these drugs have shown no clear benefit to patients. In spite of this, some doctors may still prescribe them ‘off label’ for patients with MCI with memory loss. There is only limited evidence that activities such as structured mental exercises (‘brain training’) might bring benefits to people with MCI, for example on their memory. ‘Talking therapy’, an established treatment for depression, may help people with MCI to cope better (see factsheet 445, Talking therapies (including counselling, psychotherapy and CBT)). How can we minimise the risk of MCI and dementia? Many studies have shown that age is a major risk factor for both MCI and dementia. Genes play an important role as well, most clearly for Alzheimer’s disease and fronto-temporal dementia. Similarly, several aspects of health and lifestyle are thought to influence the progression from normal ageing into MCI. 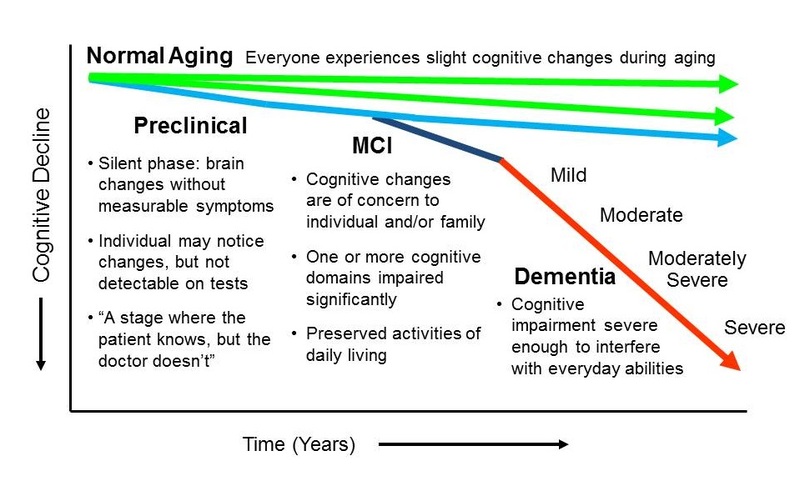 There is better evidence that many of the same risk factors also affect the progression from MCI into dementia. Medical conditions such as depression, diabetes and high blood pressure from middle age onwards are all clearly linked to a raised risk of developing dementia. It is therefore important that these are diagnosed and treated early. Other studies show that smoking, drinking too much, raised cholesterol levels and obesity also all raise the risk of dementia. Everyone, and especially someone with MCI, should reduce their risk by not smoking, drinking in moderation, eating a healthy, balanced diet and taking regular and appropriate exercise. There is some evidence that exercising the mind as well as the body can also help reduce the risk of MCI and dementia. Intellectually stimulating leisure activities such as card games or crossword puzzles in mid-life may allow the brain to build up a ‘reserve capacity’ that can help prevent or delay the onset of dementia. Keeping socially active may also help to reduce risk. For more information about the risk factors for dementia, see factsheet 450, Am I at risk of developing dementia?